Today I tried my new gadget, a SPOT Satellite GPS Messenger unit . The Spot is a GPS tracking device that transmits you location, anywhere you are. I had used one once before on The 508 so that and friends and family could track me from afar. The original model I used was a little bulky, but last year they launched a more compact model perfect for the back pockect of cycle jersey. The decent was a whole other story, which starts with me being cold at the top and nearing freezing half way down the mountain. Back from Louisville and recovering from a cold, this really was my last chance for training before taper. It was hot, very hot. The difference in humidity was very noticeable, I had acclimatized to mositure in Louisville and now the air felt very dry. To simulate the race conditions, I headed out 10:30pm with lights and a support car behind me. I choose Serria Rd, for my night route. Let me first say, I regret the large dinner I had, it was good but not the best thing before steep climb. So i started the ride, it funny how having a car constantly behind pushes you faster. Of course we also had to be mindful of other cars on the road and be sure to let them pass. The night was clear a view of the lights of the valley was great. As I was about halfway up the hill I could feel my stomach turning, but I told myself this just meant for better simulation afterall by this stage of the race I wasn't going to be feeling great. With the car behind I continued with a strong pace. This being the first time I had done the climb in the dark, I found myself constantly looking down at my Garmin to check the mileage and the elevation to get my bearings. The twists and dips in the road meant that all of sudden I could lose the light from the car's headlights, which was part of chalenge and something we would also face during the race, though it did make for some scary moments. It was now for something completely different, Louisville!! The team were doing Ironman Louisville and I was out there with my bike to support. Day one, I set out on my own to do some recon on the course to see what they would be facing. It was a two loop course and an out and back. No long step climbs, just rolling hills, this course is all about maintaining momentum. I was sweating within the first couple of miles (heck I was sweating the moment we landed). The humidity was very noticeable. I rode about 150 miles on the course, doing three loops on the loop part of the course. It was course going through my lush grassy fields with horses roaming and huge ranch style houses. I fueled at convience stores along the way. I finished the ride in the rain as a thunderstorm started. Day two, I put in another 50 miles going off the Ironman course into the surrounding area. o watch. What to do? Well ride the whole course :-) which is eaxtcly what I did. I was able to take pictures of team and track everyones progress in person. It was awesome! It was also a very hot day, as I was coming in on the last loop I was racers resting on the side of the road. I certainly had better day supporting than had I actually been doing the race. A number of the team were up in Canada for Ironman and the rest were in taper for Iroman Louisville, so I was left alone to my own devices. One route I had always wanted to do was to loop over to the coast and back the long way. This was my longest self supported ride of the year and the most challenging. I had never actually cycled over to Santa Cruz from the valley before. I kept the route simple Highway 9 to Santa Cruz, Highway 1 to Half Moon Bay, 92 to Skyline and back to Highway 9 to the start. Of course I had climbed up Highway 9 many times before but have never continued across to the other side, I found there is a good reason for that, cars. While I didn't feel in any great danger I did grea the distinct impression that the cars/SVUs did not appreciate the opportunity to share the road with a cyclist. Once at Santa Cruz, is was just a straight shot up Highway 1, with a stop a filling station to get some more fluid. I was carrying 4 water bottles so I had a good range. However I had to stop on a couple occasions to retrive the rear bottles as I hit the odd bump in the road. Highway 92 on this side of the hill was also new to me. 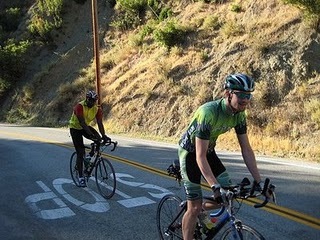 I did find it to be a little cramped to begin with, but a good shoulder appeared for the climb up to Skyline. Reaching Skyline really was just the begin of the climbing, of road that has as many ups and downs as a roller coaster. At 100 miles in, the climbs just kept coming. However it was the perfect day for the ride, not to hot or cold, just ride. I was up for the challenge and kept on going to the end. I celebrated my victory with a nice Burrito at the end. 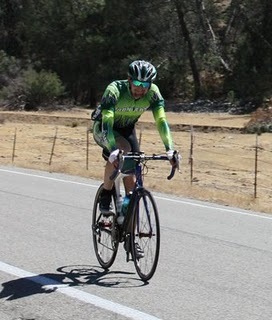 The team was nearing the end of there training for Ironman Louisville, so I had one last special ride for them, a nice climb up Mount Hamilton. I had done the same climb myself on the Devil Mountain Double back in April and found it to be great climb. The out and back route I had planned started at on Mines Rd, near to entrance to Lake DeValle, with the round trip distance totaling just over 80 miles. I knew Lousville was going to be hot and I wanted to prepare the team the best as I could. With a few exceptions I would say that most of our training rides rides had been fairly temperate. The forecast for the day had temperature peaking just under 90F and for a long exposed climb it was not going to be easy. I knew this ride would be the perfect challenge for the team. The climb to the top was indeed challenging, especially the last few miles. The good thing was I had a support stop organized for the top. One of the team would had recently completed Vineman was out to lend a hand (thanks Jeremiah). We all regroup at the top, this when the 'kind words' and 'appreciation' for me creating the route of the day began :-) I knew then my job had been accomplished and it was time to head back down.. Yesterday was truly exhausting, we had started the day at 5am and finished it at 1:30am, needless to say no one was getting up early the next day. I was on the road by 10:30am and even that felt too early, but I had another long day ahead, I wasn't driving back home, but riding. I started from the hotel the team stayed at in Windsor and headed out towards the coast. I hadn't really planned out the route, I had just had a sense of where to go from the yesterday's ride. I knew once I hit Highway 1 all I would need to do was follow it south until I reached San Francisco. The weather was great, a little cooler than yesterday making for idea conditions. I weaved my way down the coast past Bodega Bay at which point the route I was following took me inland, but all I need was to keep my eye out for the signs. As I was on my own with no support close at had I came out with a Camelbak to keep me hydrated. With yestersday flat fresh in my mind I not only was carrying a spare tube, but a spare tire for extra measure. The journey was by no means flat, as I headed back out to towards the coast a few hills were in my path. Over the hill the sky was overcast and it appeared I had reached a different climate. It was fitting that I was aproaching the town of Inverness. The scenary is diffinately reminisant of Scottish Loch I know well. I took a lunch break at Point Reyes Station and quickily inhaled a sandwich there. Back the road there were a few more hills between me and the coast. The route continued parallel to the coast though I was in valley with no site of it on my left. 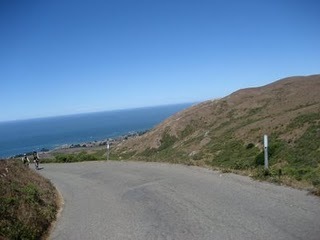 Now at mile 83 I had reached Stinson beach and with a blue sky back again I was crusing. The biggest challenge lay ahead, Mount Tamalpais. As I continued on Highway One, I started the grind up the side of the mountain, I was on twisting roads with a sheer drop on my near side. To add to the fun, people were returning home from the beach adding to the cards on the road. Not too fast and not to slow was the game, make sure I'm seen and safe. Despite the very literall downside to the road, the view were breath taking! It was not long before I was safely into the hills heading towards Sausalito. Remember I said I didn't have the entire route planned out? Well here is where the adventerous part comes in navigating through the city the to reach the Golden Gate bridge. It wasn't too bad, I followed the coast line and with some directions from another cyclist found my way to the bridge's bike path. I hadn't been across on bike before and certainly wasn't prepared for the evening breeze, but it is a spectacular crossing and highly recommended. This weekend I was up in Santa Rosa area to support the Ironteam who were doing the Full Vineman (Ironman distance). The morning started as earlier as the racers, a bunch us were volunteering at the first transistion area. My job was to make sure no non-atheletes entered the transistion area to keep it secure. By around 9am the area was closing down as the last swimmers were coming out of the water. It was now time for those of us who were not doing the event to get our training in for the day done. The rest of the route was easy to folow. The downhill had a couple of Cattle grid, which is always a great way to verify everything is attached correctly. With about five miles to go, I got a flat. After a quick repair, a less than a mile later I had second flat. With a through check of tire and second tube I was back on my way and glad to be close to end. Overall I have to say it was a great route and nic change to be cycling in a new area. In the evening we headed over the run course to cheer on the team, the weather had hit the high nineties earlier and it was still hot. The team on the course were going strong despite the conditions. The run course was a three loop course which is great for spectating. By 10:00 it was dark and there was only an hour to go before the official cutoff. There were still a number of the team out on the course, we ran in few people and cheer them on. It was time to ship off the bike for Lake Placid. I had just gotten the my new Zipp Wheelset fitted to bike so one quick test ride was in order. I did a quick loop up through Portola Valley, new new wheels felt great, giving better aero-dynamics and acceleration. On the training schedule was the Mental Toughness ride, a 100-mile solo ride. I like a good un-interrupted ride, so I choose Highway 1 for the ride. My mental toughness, was not in question on the ride but my toughness of my bike was. Highway 1 can be a little rough around the edges, unfortunately it wasn't until mid-way through the ride I realized that I was not only missing a bottle but the entire cage from the rear of my bike. I spent the ride back looking across the road to see if I could retrive it, but alas no luck. On the upside I still had enough fluid to keep me going the rest of the ride. My second Double Century of year, was at high elevation, starting in Bishop. The ride start was early still dark at the time, the course started off doing a loop around the outskirts of town before heading up towards Mono Lake. The first 80 miles had the majority of climb for the day, it also offered great views of the valley. We passed through Mammoth and then on to Hwy 395 towards to get to Mono Lake. Having just arrived the day before I was not acclimatized to the elevation, going from 4,000 at the start to 8,000, I was really starting to miss the oyxgen of sea level. I took a longer than usual break at lunch to recover. Back on the road I was ready for the last big climb. The last 50 miles was almost all downhill, the really bonus was a tail wind on the last 25 miles. I finished the riding feeling great! Today is my turn to make up the route for team ride, I thought how about a little climbing to usher in the New Year, so it had to be the return to King's Mountain! I created made the maps and memorized the route the night before, it won't look to good get lost on the ride I was leading, although when have I ever got lost :-) We started the ride at Edgewood and Canada Road, just north of Woodside, it was a very driech looking morning and not the warmest to be sure, I layered up though decided to forgo the leg warmers knowing I'd be burning up on the climb with them on. I led the ride out and kept the group together, the easy part to get lost on a ride is always the beginning, the middle can be troublesome and don't get me started on the end, but this was a mostly simple route with as few turns as I manage. After winding through the back roads of Woodside we reached the base of King's Mountain and the fun began (yes climbing is fun, just keep repeating that in your head). At this point I broke from the team, climbing is best done at a comfortable pace and the quicker I reach the top the more comfortable I feel. To mark the one week anniversary of my failed my bike ride, I was back for the same route, this time though I had brought my other bike and apparently due to a packing error some odd gloves (at least I still have a right and left even if they didn't match). I headed up Steven's Creek Canyon Rd, and continued up Redwood Gulch with great determination, I would not stop, I would succeed. As long as succeeding just means in this case getting to the top without stopping then my goal was meet, if it had been to keep my heart under my lactate threshold, then I still need to do some work. From Redwood Gulch, I continued up Highway 9, along Skyline to Highway 92. It was great afternoon and perfect route for very few stops. I came back along Canada Rd, through Woodside and Portola Valley, eventually getting back to Foothill Expressway to complete the route. It felt great to get a long ride in, this is never a disappointing route. 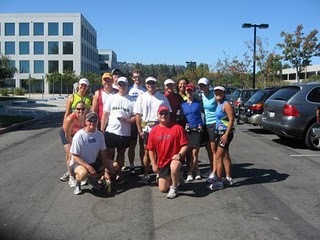 This morning was a short Captain's Ride with the Ironteam, we met near Almaden park to start the ride. 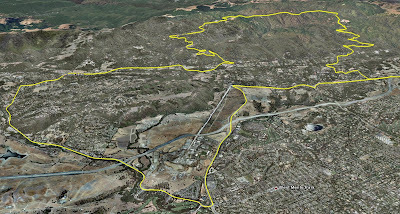 The route was out on McKean towards Uvas out and back in 1 hour. Well when you just have hour to complete a ride you have to make it fast :-) We followed up with a short run afterwards.